Ron Dante | Concerts At Sea 50s & 60s Themed Oldies Cruise - Where The Action Is! 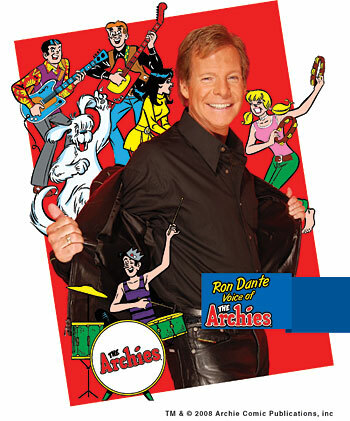 Ron Dante is best known as the lead singer of the fictional cartoon band The Archies; he was also the voice of The Cuff Links and co-produced Barry Manilow’s first nine albums. The Archies single “Sugar, Sugar,” written and composed by producer Jeff Barry with Andy Kim, was the number-one selling record of 1969 in the United States. Four years earlier, Dante had been a member of the parody group The Detergents, who recorded a novelty song called “Leader of the Laundromat.” Concurrent with his work on the Archies project, Dante was also employed as a session singer and performed many television and commercial jingles. In 1969, Dante recorded an album under the group name of The Cuff Links for his old Detergents songwriter-producers Paul Vance and Lee Pockriss. Providing both lead and background vocals through overdubbing, as he did with most of the male Archies vocals, Dante hit the U.S. Top Ten with the single “Tracy,” at the same time that “Sugar, Sugar” occupied the top of the chart. Dante was anonymous on both tracks. Contrary to popular belief, the lead verses of another Archies single, “Jingle Jangle” (portrayed as being sung by either Betty or Veronica), were not sung by a female vocalist, but rather by Dante using falsetto vocals. Dante’s first album release under his own name, which he recorded on Don Kirshner‘s label, was Ron Dante Brings You Up in 1970. In 1972, also under the supervision of Kirshner, Dante became lead vocalist for another cartoon group, The Chan Clan. He provided lead vocals for a number of songs on the 1972 LP “Spiderman : From Beyond the Grave, A Rockcomic” credited to The Webspinners. Ron Dante appeared on a 1975 CBS TV pilot show called Hip Patches. He is interviewed by a group of young musicians in a band named Silvermoon who were meant to be the stars of the show. On that show, he is introduced as the voice of “all five Archies” and explains to the audience what it takes to be a successful band. In 1979, he recorded a disco album under the name Dante’s Inferno for the Infinity Records label, and in 1981 his second solo album Street Angel was released. Also in 1979, Dante performed the theme to the NBC television series $weepstake$: “Don’t Be Afraid To Dream,” whose lyrics were written by Norman Gimbel and whose music was composed by Charles Fox. From 1973 to 1981, Dante was the record producer for singer Barry Manilow, and often sang backup on Manilow’s recordings, including the 1974 #1 single “Mandy.” Dante continued to record sporadically during those years; in 1975, with Manilow as the producer, Dante released a dance version of “Sugar, Sugar” under his own name. In 1978, Dante produced the Tony Award-winning musical revue Ain’t Misbehavin’ on Broadway. During this same period, Dante, who was a Manhattan neighbor of George Plimpton, was invited to serve as the publisher of the Paris Review, as whose publisher he so served from 1978 to 1985. As of late July 2016, Dante remained active as a singer, producer, and concert performer. An album, Favorites, was released in 1999, and another CD, Saturday Night Blast, was issued in 2004. The extended play California Weekend CD was released in 2006.